The panorama we behold perfectly fits Cacela’s description. The only exception is the paved roads and the zinc roofs, a disillusionment as I was expecting more commitment in the preservation of the local architecture genuineness. Brief walks through the area prove, nevertheless, the excellent state and the beauty of these dwellings with the bottom made of adobe and the top of wood carved and embedded in each other without recourse to any nails. The finishing of the roofs is executed and painted by hand. The walls of some of these houses are illustrated, especially near the doors and windows. Drawings of people or animals, suggesting a protective function. Phalluses of different sizes call the visitor’s attention. Sangay informs that his existence is due to the monk Drukpa Kunley (1455-1529), popularly known as “mad saint” or “saint of fertility.” Kunley, breaking with the social canons of the time, turned to unorthodox Buddhist teaching methods. The break with the ecclesiastical entities of the kingdom was only a matter of time… Of course they reproved the method, although the common mortals promptly adhered to the practice. Thus spread the habit of painting phalluses, some of them winged, on the facades and eaves of homes so as to drive out the evil spirits and subdue the demons. Perhaps because of the embarrassment they could cause, explicit art would be discouraged in the urban centers and places of celibate residence of monks and nuns. 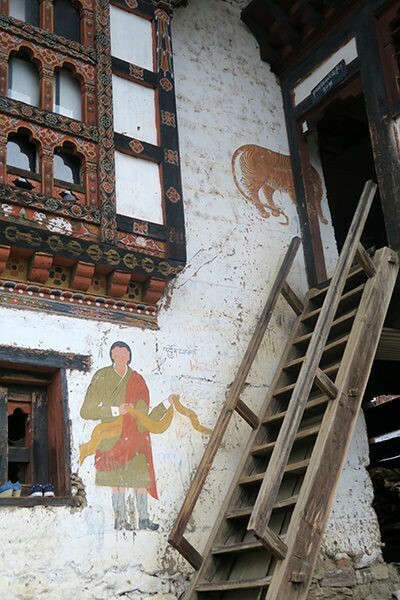 The monastery of Chimi Lhakhang, near Punakha – allegedly built by the “mad saint” – is the place of origin of such esoteric symbols. As far as the Himalayan region is concerned, phallic worship was an integral part of the Bon religion – long before Buddhism became State doctrine – and was present in all liturgies. Understandably, by propriety, Father Cacela tells us nothing on this, contrary to what others did in their place and in similar situations. It was normal that he had condemned them, as would be plausible in view of his moral training, and it is more than certain that he was confronted several times with such a reality.